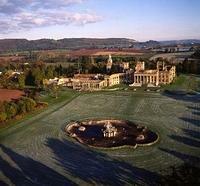 One hundred years ago, Witley Court was one of England's great country houses. Today it is a spectacular ruin following a great fire in 1937. A flavour of life in its heyday can be had with the help of the personal audio tour, through which you can listen to household memories of life upstairs and downstairs. Standing in the ballroom it's easy to visualise the splendour of this great house before the fire. This impression is continued when strolling around the parterre gardens, following in the footsteps of the Victorians when the Prince of Wales used to visit. The stunning Perseus and Andromeda fountain makes an impressive centrepiece. This fully restored work was designed by William Nesfield and was once the biggest in Europe. There are Woodland Walks in the north park which contain a fascinating collection of plants and shrubs from around the World, while the Wilderness Garden offers a less regimented environment and is part of the Contemporary Heritage garden project.